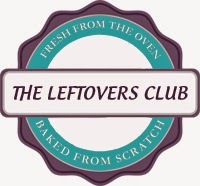 Another post for the Leftovers Club today! And once again, I am very thankful to have had somebody to share this stuff with because... oh my. It's way too good. Spicy, tangy, a little bit sweet. ADDICTIVE. I made it super easy on myself by using snack mix and mixed nuts, but you could really mix and match any crunchy snacks and nuts you like for this. Because, let's be honest, pretty much anything covered in this chipotle lime butter would be delicious! I sent a jar of this stuff to Kathia from Basic N Delicious - I hope she loved it as much as we did! Preheat the oven to 250 degrees F. Line two baking sheets with parchment paper. Melt the butter in a saucepan over lowest heat. Remove from heat and stir in the lime juice, Worcestershire, brown sugar, paprika, cinnamon, chile powder, garlic, cumin, lime zest, and cayenne. Combine the snack mix, nuts, and butter mixture in a large bowl and stir until everything is well-coated. Spread the mixture evenly over the 2 baking sheets in one layer. Bake for 40-45 minutes, rotating the sheets halfway through. Allow to cool for 15 minutes before serving. Oh my gosh, I think I'd just shove my head in a bowl of this and not come up for air until I'd inhaled every last morsel. Haha, it's definitely hard to resist!! Love the name, and need, need this with a big icy cold beer. Yum!! Great snack idea!! Lots of protein and carbs with a kick! I'm all about that party mix life. I love making different versions of trash and this one looks like the best yet! This is seriously one of my all-time favorite flavor combos. And who doesn't love a good snack mix?! Chipotle lime is the best! I know what you mean :) Thanks! I love everything about this snack mix! I can see myself munching on this for an afternoon snack! I've made TX Trash, but it was NOT chipotle lime flavored--loving that idea! YUM! What an awesome trail mix!